Badgers have been much in the news recently because of the cull areas in Gloucestershire and Somerset. But badgers have problems other than being culled – they are frequent targets of a strange and violent breed of men who dig them from their setts after locating them with terriers, and subject them to extreme cruelty before eventually killing them. 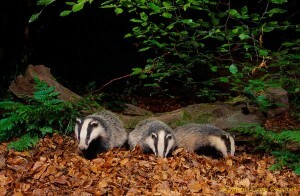 Badgers are also coursed with large dogs, often bull lurchers, and suffer the same fate. They are sometimes deliberately snared, and their setts may occasionally be damaged by agricultural, forestry or development operations. It is hardly surprising then that badgers have an Act of Parliament all to themselves: The Protection of Badgers Act 1992. Away from all this grief, badgers are extremely social animals, living in family groups, usually in a main sett with a number of extra, smaller, setts within the family group’s territory. In many cases the main sett – a network of underground tunnels with numerous entrances – will have been used by many generations of badgers. The spoil heaps dug out to create and enlarge the tunnel may contain tons of earth and occasionally the bones of long-dead badgers. A typical badger ‘clan’ may contain a dominant male (boar), one or more females (sows) and usually some younger family members. At an active sett there are likely to be well-worn paths leading from some of the entrances, perhaps to another outlying sett or to a gap through a fence or hedge. Paw prints, rather like those of a small bear, might be visible at the entrances, and there may be bedding brought out to be aired since badgers are exceptionally clean animals. Latrines, small pits dug by the badgers into which they deposit their dung, are often found near to the sett. These are covered over when full and a new latrine is dug. Badgers are omnivorous, with a particular love of earthworms, bulbs and autumn fruit such as berries and apples, but they will readily eat cereals, nuts, birds’ eggs and dead animals and birds too. They frequently eat young rabbits in a burrow, digging right down on top of them rather than digging from the burrow entrance inwards. With their varied appetite they are not the best visitor to a vegetable garden, though this is most likely to occur during extended dry periods when earthworms are not available to them. When breeding, badgers, like some other mustelids (and, unusually, roe deer) have ‘delayed implantation’. 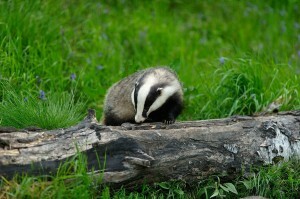 Badgers can mate at any time of the year but the embryo does not start growing in the womb until winter. All cubs are therefore born around the same time, late January to March. There are usually two or three cubs in a litter, which don’t start to emerge from the sett till late April/early May. Occasionally a fox may use part of the sett to have cubs, so it is possible to have badger cubs and fox cubs in the same sett. Unfortunately foxes with cubs are dirty neighbours, leaving parts of dead rabbits and birds around outside, so are not the most welcome of tenants.